Salomon’s new Hike+ initiative for the Autumn/Winter 2017 season is a direction driven by individuals who are at the forefront of evolving their chosen outdoor pursuit. When it comes to hiking, that means delivering products for the growing number of people who are combining their love of hiking with other sports, often in the same day. For that reason, Salomon’s new Hike+ campaign features several new footwear, apparel and gear offerings designed with multi-sport use in mind. Here at SLOAN! 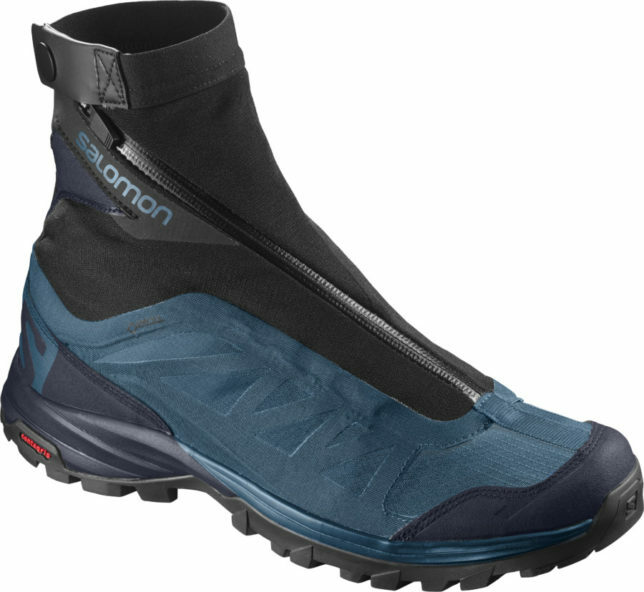 HQ, we love Salomon new Out Path Pro GTX® shoe which is a lightweight hiking shoe that allows hikers to move freely in the mountains while also feeling their feet are protected from the terrain and the elements. The lightweight Out Path Pro GTX® shoe has an innovative support system and durable construction and weighs only 390 grams. It is as light as a trail running shoe, but still offers the durability, protection and stability of a light hiking shoe. Salomon’s new Active Support Technology protects your ankles in uneven and uncharted territory, while still maintaining lightness and delivering exceptional freedom of movement. The shoe also utilizes resistant mesh and an innovative seamless construction technique that actually welds textile onto textile. The result is a stronger and more durable shoe that withstands rugged use. People hike for a variety of reasons—to spend a few uninterrupted hours in nature; to enjoy social time with family and friends; to increase the heart rate and burn a few calories; or simply to get to the top of a mountain because it’s there. Research and interviews with hikers told Salomon product developers that an increasing number of people are combining this passion with other sports like rafting, mountain biking, trail running and even paragliding. This means that the new Out Path Pro GTX® shoe answers all those needs and more. If you’re a hiker who also likes to let go on piste and enjoy the rush of frontside skiing, then you’ll love the Ranger2 Custom Air Helmet also from Salomon. From its roots stretching back to 1947 in the French Alps, Salomon is passionate about mountain sport progression, craftsmanship, quality and product development. This passion drives the brand to create progressive gear like the Ranger2 C. Air which enables skiers freedom allowing them to truly challenge themselves on piste. The Ranger2 Helmet embodies Salomon’s approach to resort skiing. Wildly successful for it’s comfort, lightweight, and style, the popular Ranger2 helmet has been updated to add even more value and performance. It keeps the low profile design and basic fit that have made it successful, and the Custom Air system for a personalized fit but now has the added bonus of an AdvancedSkin ActiveDry liner to help manage moisture and temperature for all day comfort. 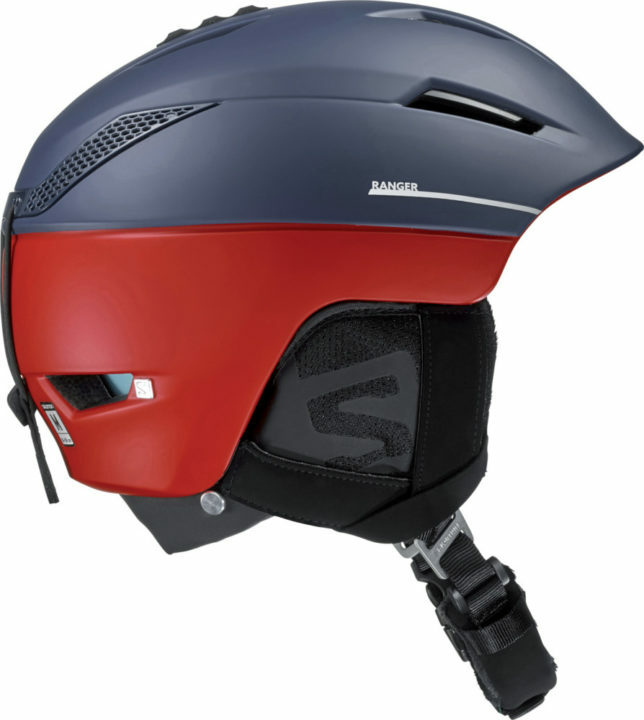 The Ranger2 Helmet also features Salomon’s unique EPS 4D technology. 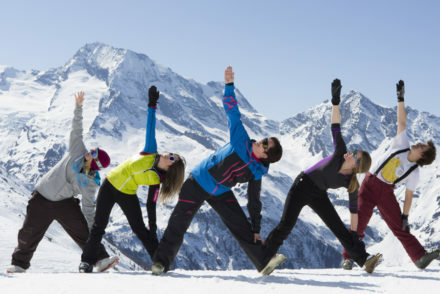 EPS 4D is a moulding solution that addresses all of the different types of impacts associated with skiing. Based on extensive studies of the causes and types of impact associated with ski injuries, there are 2 types of impacts that helmets must address. The first is direct, or vertical impact. The other is oblique impact, which means a glancing blow or indirect hit. Developed in collaboration with doctors and researchers from the Laboratory of Applied Biomechanics at the University of Marseille, EPS 4D is able to manage both of these impacts better than other helmet technologies. In fact, EPS 4D absorbs 30% more impact than the industry requirement. Both these awesome Salomon hiking and skiing products appear in the November 2017 edition of SLOAN! 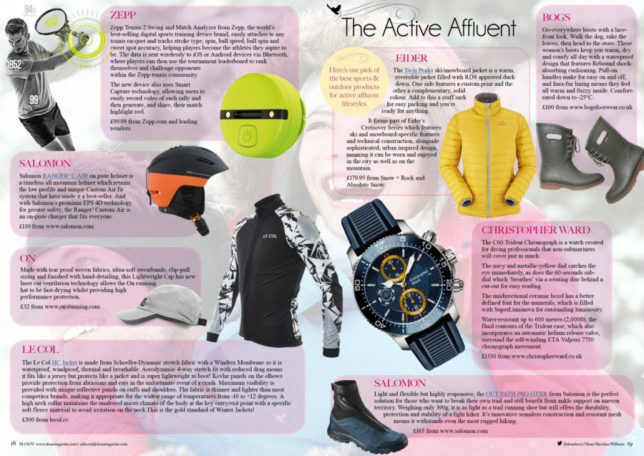 as part of our Active Affluent winter sports feature. Click here to go to the free digital edition of the magazine.